Writing this because I could not find a solution on Google when the virus hit my computer. Hopefully, someone else who needs it will see this! Symptoms : Virus changes folders to a screensaver with extensions '.scr'. For example, Movies becomes Movies.scr and Photos becomes Photos.scr. These folders cannot be opened and are only 40kb or so. However, the space previously occupied by your files is still taken up. The virus copies the folder name and creates a .scr file with the same name, PRETENDING to be your folder. It is in fact NOT your folder. It then proceeds to HIDE your original files so you naturally assume that the .scr files are your folders which have been locked somehow. 1) Scan with your anti-virus and delete all .scr files. I know these files may have scary names like WeddingPhotos.scr which you might think "oh no.. I can't delete my wedding photos!" but it's not your wedding photos so just delete it. 2) Show hidden files. 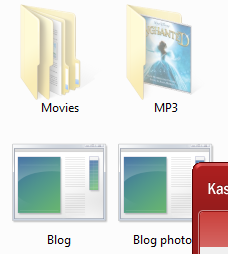 For Windows 7, it's Control Panel > Appearance and Personalization > Folder Options. 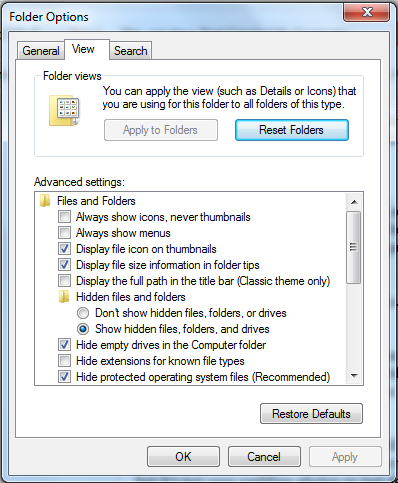 Check "Show hidden files, folders and drives". You will now see your REAL folders (real wedding photos) but they are faint coloured (hidden). 3) Permanently unhide folders by right clicking on the folder > Properties > Uncheck "Hidden" then it will prompt you to apply for all sub folders. Click yes to make your life easier. 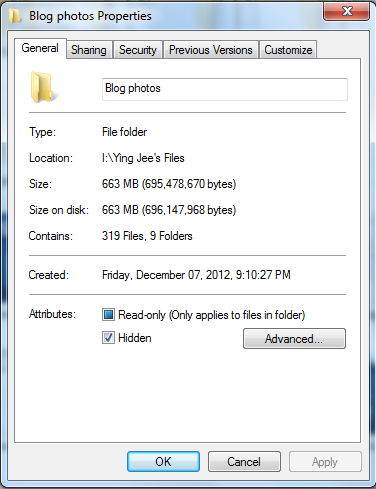 Your blog entry juz saved my laptop!!! Thx a lot!!! Many thanks... you just save my day!